While attending the National Alliance for Grieving Children conference, Dr. Heidi Horsley talks to Cindy Meek about Amanda the Panda, a grief support group. She’s the program coordinator in West Point, Iowa. 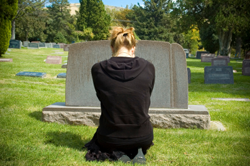 The organization offers a free year of grief support to anyone who’s experienced a loss. There are camps, family nights, and other events offering peer to peer support. The whole family is welcome, and Meek says the biggest step to healing is realizing you’re not alone. Others have been in your situation, and there’s great power in healing and reaching out. Secondly, know that grief is something that takes time and support. Being at a center with great activities can bring joy and hope back to your life. It takes being around others in a supportive environment. Meek encourages everyone who’s experienced a loss to reach out, share their story, and realize that grief is a normal healing process. Many times after a loss, your support system isn’t what you think it will be. It’s often necessary to be the proactive one and identify your new best support systems. Don’t assume friends and family will offer the best support because they may not know how. Taking action and defining your own healing path is critical. Fortunately there are many organizations like Amanda the Panda, in person and online, that can help. There are more avenues for supportive healing than ever before, but it still requires that first step. Plus, know that everyone heals differently. That’s normal and is to be expected. That’s why Meek’s organization offers peer to peer support for all ages, so you can connect and identify with people who really are in your shoes. Still, attending as a family unit can help strengthen bonds.